Carmen and Jeff discuss mechanical bearings in this episode of The Engineering Commons podcast. Carmen has a pretty good sense of his navigational bearing, but is less knowledgeable about mechanical bearings. U.S. interstate highways are numbered with even numbered roads going primarily east-west, and odd numbered roads passing mostly north-south. Differences between skateboards and longboards are noted by Carmen. A distinction is made between rotational and linear-motion bearings. Non-contact fluid bearings may be of the hydrostatic or hydrodynamic variety. Magnetic bearings allow for higher relative motion velocities, albeit at a higher cost than other non-contact bearings. Carmen mentions the Laser Interferometer Gravitational-Wave Observatory (LIGO) experiment that detects cosmic gravitational waves. A flexure bearing allows relative motion to take place through bending of the bearing element. The lid of a Tic Tac box provides an example of a flexure bearing. The two most commons types of bearings are journal bearings and rolling-element bearings. Oilite is a porous bronze alloy impregnated with an oil lubricant. Engineers must consider the tradeoffs between using oil or grease when lubricating a bearing. A starting point for choosing a plain bearing is calculating a PV value (pdf). A pillow block may be used to attach a bearing to a component lacking room for a bearing bore. 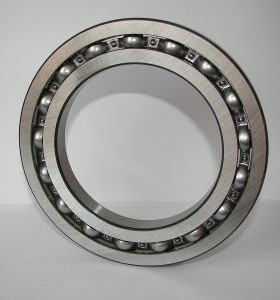 A ball bearing consists of an inner race, an outer race, balls, and a cage. Assembling a ball bearing is fairly straightforward once you’ve seen how it’s done. Ball bearings may be ordered with either shields or seals to limit the amount of contamination able to reach the rolling elements. Bearing quality can vary significantly between manufacturers. A variety of roller bearings can be used to support greater radial and axial loads than can be handled by a ball bearing. It’s important to apply the correct amount of preload to angular contact bearings. Thanks to WikiMedia Commons for use of the photo titled “Ball Bearing 2.” Opening music by John Trimble, and concluding theme by Paul Stevenson. I’m a little disappointed. You only discussed bearings for rotary applications and left out some of the most exciting bearings such as linear bearings and ball screws. I work for a small 3d printer manufacturer and these are central to our designs. In this age of automation, these motion control elements are very important and engineers need to know about them and how to judge their quality.